The release of Java 8 was considered a game changer for the Java platform. With new features like lambda expressions, streams, and the new Date and Time APIs, the Java 8 demonstrates that a language can be modernized without compromising stability or backward compatibility. 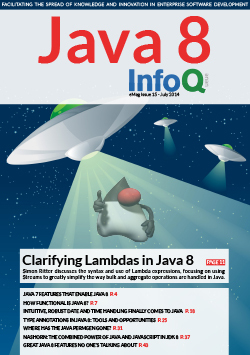 In this eMag we explore some of the important or lesser known features of Java 8, along with a glimpse of how we got here.